The finals of the ATP Champions Tour were contested Tuesday night at the Delray Beach Stadium & Tennis Center between Australian Patrick Rafter and American tennis legend John McEnroe. The meeting between the two former majors winners was expected to be a display of serve and volley, both delivered. 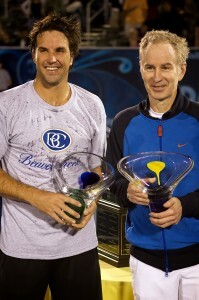 Rafter prevailed over McEnroe 7-6 (7-4), 7-6 (7-1) in two highly competitive sets. 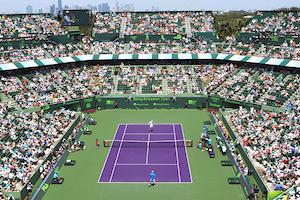 Although the ATP Champions Tour has been in existence since 1997, the four day event in Delray marked the Champions Tour’s inaugural stop on U.S. soil. McEnroe qualified for the finals by going undefeated in Group A (3-0) highlighted by wins over Mats Wilander and Andres Gomez. Despite losing to Ronald Agenor, in Group B, Rafter advanced by beating Aaron Krickstein and Pat Cash. Rafter was favored in the final in light of his age. However, McEnroe held his own in the match. The difference was Rafter’s ability to raise his game level in the tiebreakers. McEnroe would later concede during the trophy ceremony that Rafter was “too good.” Also, McEnroe jokingly said that Rafter is “younger, faster, and better-looking than me.” The win places Rafter at the top of the rankings of The Champions Tour. The Champions tour moves next to Zurich on March 9. Turning to the ATP Tour’s main draw, top seed Tommy Haas was upset on Monday night by Teimuraz Gabashvilli in straight sets. Despite dropping a set to Nicolas Lapentti, Evgeny Korolev, last year’s finalist, advanced. Mardy Fish, the 2009 champion, moved on when Christophe Rochus retired at 3 all in the third set. Second seed Ivo Karlovic ousted Philipp Petzschner while Kie Nishikori, 2008 champion, fell to third seed Benjamin Becker . Although it may seem like eons ago, there was a time in tennis when one could distinguish two different types of players because they relied predominantly on one style of play. Competitors were earmarked as either baseline grinders or serve and volleyers. In the last few years, there has been a scarcity in the singles’ game of the latter type of play. Homogeneity has become the rule with competitors apparently content with being branded baseline specialists, not venturing to the net even when the occasion clearly presents itself. Thus, this begs the questions as to whether the “classic” serve and volleyer will become a thing of the past. In a society where the desire for instant gratification is the norm, one would think that the serve and volley would be better appreciated because it does not demand a long attention span. Simplistic as it may sound, there may be a logical explanation for the gravitation towards baseline play, power- the ultimate high. From my viewpoint, this love affair may arise from one’s desire to take his or her aggression not only on the ball but to also demonstrate his or her dominance over the opponent; a statement made less effectively by the serve and volley precisely because the points are too short. Advancements in technology are in part to blame for the prospect of this art form being retired to the tennis hall of fame. As wooden rackets have given way to metal ones, players have been able to generate so much power with their shots that their primary goal appears to be to hit a winner from five feet behind the baseline. Granted, this type of play is simultaneously exciting and exasperating. Enjoyable in the sense that one is amazed at the player’s ability, for instance, to maintain a thirty plus stroke rally. On the hand, endurance at times gives way to boredom on the part of the viewer when he or she realizes that shots are just mirror images. Baseline play appears quasi a duel, a display of raw power, conjuring up images of two battling gladiators. Yet, the beauty of the serve and volley lies in the subtlety with which power is exhibited; power is the essence of that style of play. Historically, the most successful serve and volleyers have been the likes Boris Becker and Pete Sampras whose blazing serve was their invitation to the net. These days, big servers are widespread, but proficiency at the net is lacking. At times, net play seems either an afterthought or a tactic of last resort. Even the volley itself has undergone some modifications. 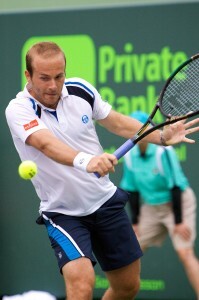 With the traditional volley, the player maintains his racket in front as he rushes the net where he finishes with a crisp shot with the racket in that same stance. Nowadays, the uneasiness that some competitors feel with the conventional volley, since they utilize it so sparingly, has given birth to the “swing volley”, a more aggressively struck shot, leaving the only similarity between the two the location from which the ball is hit. To the observer, this is further evidence that some players are just having difficulty mastering the fundamentals of volleying. In essence, technology has been both a blessing and curse in that the serve and volley may become obsolete on the surface best suited for it, grass. With the exception of Bjorn Borg who was a baseline player and won five Wimbledon titles, history has shown that when the “classic” serve and volleyer is confronted with the baseline hoverer in the finals, the former has usually come out the victor. The speed of this type of court has always favored the competitor willing to come to the net. Over the last few years though, baseline play has invaded even this surface, at the end of a fortnight of competition, the baseline is the part of the court that is most worn out is while the grass around the net stays pretty intact. Lately, there have been rumors the All England Club may be altering the composition of the grass to “slow” down the court. 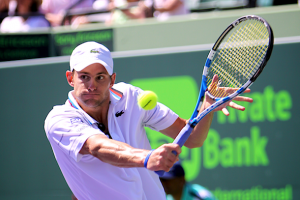 Invariably, this kind of move may mean that players whose game fare better on a clay court may have better result while serving to the detriment of the serve and volleyer. It seems that the talented athlete should be able to adjust his game regardless of the surface without technology having to be a key variable. In my opinion, variety is an important element when it comes to spectator sports. The ideal player is one who can marry the two forms of play. Versatility provides excitement and captures the interest of the viewer, thus, there is still a place in the game for the “classic” serve and volleyer. Two excellent examples are Martina Hingis and Roger Federer, both from Switzerland. The words often used by tennis connoisseurs to describe Hingis are a “ smart player”; she is an expert at both baseline and net play, with variety being the cornerstone of her game. Although Hingis was formidable enough to defeat lower ranked players, she could not keep up with the so-called “power hitters”. Ironically, power was often the latter’s only weapon against Hingis’ well-rounded game. Like Hingis, Federer is a master at shot selection. He knows when to charge the net and when to stay back or play from the baseline. Unlike his compatriot, Federer is capable of bombing the serve or to sustain a rally and hit a winner from the baseline when the opportunity presents itself; thereby, neutralizing the opponent’s power. Since everyone is not as gifted as Federer or Hingis, there exists a need to focus on finding out where the player’s talent lies since that is an integral part of the equation. Obviously, all baseliners are not proficient at the craft. Otherwise, there would a more equitable distribution of trophies and not the skewed dominance exhibited by just a few players. The hope is that the current trend is cyclical. Perhaps, eventually balance will be restored whereby both styles can flourish so that the serve and volley will not become a dying art.